Beau Brummell arrived punctually at the estate of Frederica, the Duchess of York, as her special guest for her birthday celebration. Unfortunately, his valet — and his valises full of proper attire — have gone missing, leaving the arbiter of fashion out of fashion for his first night as Freddie's guest. When Beau's valet does appear, he reveals the shocking news that he was set upon by highwaymen, who stole most of his master's luggage — including an indiscreet letter that Freddie wrote to Beau, which could embroil them both in scandal. "This latest in the Beau Brummell series shows Ms. Stevens in top form. Mystery fans will appreciate the complicated, well-devised plot and fans of the ton will also be in for their share of fun as the author has included a fine amount of gossip, scandal, and sparkling wit." 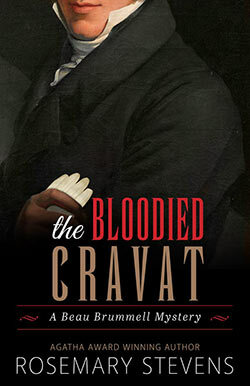 "Dandy and amateur sleuth Beau Brummell continues to charm in this third whodunit from Agatha Award winner Stevens. Renowned for his sartorial splendor and elegance, Brummell has come to Oatlands, the country home of the Duke and Duchess of York, to be with Frederica, the duchess, as she celebrates her birthday while her husband is off with his mistress. When a highwayman robs Robinson, his valet, en route to Oatlands, Brummell isn't as concerned about his lost clothes as he is about his stolen blue-velvet-covered scrapbook, which contains a letter from Frederica that if made public could cause a royal scandal and Brummell's social downfall. After the universally disliked Marquess of Kendrick threatens blackmail and is subsequently murdered, Frederica calls in Mr. Lavender of Bow Street. As the investigation progresses and the murders mount, the author expertly uses red herrings to keep Brummell and the reader guessing. A multitude of authentic historical figures add to the fun in this vivid portrait of Regency England. Stevens deftly captures the magnificence of the wealthy's country estates and the glittering atmosphere of London at the height of the social season. Combined with a witty, suave and romantic Brummell, who unravels the mystery as meticulously as he dresses, this is sure to appeal to a wide variety of fans." A commotion from the hallway interrupted us. Ulga rose from her chair with surprising speed for someone of her size and flung open the sitting room door. The sight that met us threw my emotions into confusion and sent my eyebrows soaring to my hairline. Next to me, Freddie let out a gasp. No doubt it was one born of a mixture of despair and delight. "Robinson! For the love of heaven!" Freddie exclaimed. "Good evening, your Royal Highness," Robinson said, entering the room with great dignity considering his shockingly disheveled appearance. He bowed low. Turning to me, he continued in a long suffering tone, "Here is the item you asked I bring to Oatlands, sir. What shall I do with it?" I hesitated, my gaze taking in the valet's demeanor, then I said, "Give it to me." Robinson sighed heavily, but obeyed. Freddie's eyes gleamed with excitement when she looked upon the contents of my arms, but her innate concern for a fellow human caused her to focus upon Robinson. "What has happened to you? Your clothes are torn and dusty, and--oh!--is that blood on your cuff?" She left out the part about how Robinson's blond hair, which he carefully combs into the fashionable Brutus style, was pushed back from his forehead and standing up like wheat in a field. Dirt smudged his left cheek, there was a small cut on his right cheek, and indeed, dried blood on his right cuff and his hand. "Good God, man, where have you been? A pugilistic contest?" I asked, balancing the article I held in the cradle of my arm. Robinson stood with his Martyr Expression firmly fixed in place. He spoke in a deceptively calm voice, the tone he employs when he has been tried to the maximum, survived the ordeal, and now wishes to convey the news of his heroism. "A pugilistic contest?" he answered, his lip curled. "Certainly not, sir. I have only been following your directions to convey the Royal Duchess's birthday gift here, along with our clothing for our stay at Oatlands. A few miles short of my destination, the coach I rode in was set upon by a highwayman." Robinson paused to savour the effect this statement had on us. Indeed, Freddie's jaw dropped, Ulga clutched her knitting to her chest, and I know my face reflected my shock. "A highwayman? In this part of the countryside?" "Pray, forgive me. I had quite forgotten," Freddie said. "There have indeed been similar incidents over the past two or three years, though only a few in the last year. The villains have never been apprehended. No one has ever been hurt, but people have lost money and jewels. I shall report this latest attack to Squire Oxberry, our local magistrate, first thing in the morning." "Fred--er, Duchess, why did you not inform me of this?" I asked Freddie, fear for her safety rising in me. "You may have been in danger." "Nonsense," Freddie declared. "No one would dare try to rob the Duchess of York. Now, Robinson, pray continue. Ulga, pour him a glass of sherry. I am sure he would appreciate it." "Thank you, your Royal Highness," Robinson said. "I was riding with Mr. Brummell's and my valises and his gift to you, when, over the course of an hour, my coach fell a considerable distance behind Mr. Brummell's. The number of coaches leaving London made it impossible for us to remain together. Later, a man crossing the road with a herd of cows was the cause of the first major detainment, then a farm cart spilled crates of chickens across our path, further impeding my progress." Robinson paused in the telling of his tale to accept a glass from Ulga. After taking a restorative sip, he resumed his tale. "Apart from those postponements, the coachman, more of a drunkard than a driver if my opinion were to be solicited, stopped at a hedge tavern for a glass of gin. I admonished him upon his return, but by that time, his state of inebriation enabled him to disregard my words without a second thought. He carried a bottle with him, which I have not the slightest doubt he drank from as he drove. A despicable practice employed by far too many coachmen. "Perhaps half an hour later, the words 'Stand and Deliver' rang out. The coachman stopped the vehicle at once, and, if I may say with no small measure of scorn, attempted to get down from his seat, but instead proceeded to lose consciousness, ending up face first in the dirt of the road." Robinson looked at me. "You had given me the strictest of instructions to take care of the Royal Duchess's birthday gift above all things, sir, and that is what I endeavoured to do. Because my hands were busy," here, Robinson shot a look of sheer loathing at the contents of my arms, "the villain made away with as many of our valises as he could carry. Fortunately, he did not discover your mahogany dressing case, sir, and two valises remain. I would have fought the highwayman, but--"
"You could not as you saved that dear, dear little doggie," Freddie cried out in admiration. She turned to me. "Oh, George, I am not being too presumptuous in asking if that precious, beautiful animal is to be mine, am I?" I barely heard her words. My mind grappled with a single concern. And no, not the loss of my clothes. The highwayman could not have taken the bag containing my blue velvet book, I told myself. He could not have. I would find the scrapbook safe within one of the valises that Robinson said had been spared, right where I myself had packed it. "George?" Freddie said, looking at me inquiringly. "Yes, Duchess," I managed with less than my usual aplomb. I transferred the dog to her waiting arms. "I do hope you will be pleased with the little fellow. Happy Birthday a day early." Freddie's lips curved into a smile. "How could I not be happy with him? Is he, indeed, the kind I think he is?" "He is a spaniel of the King Charles breed," I replied absently. "I purchased him from the Duke of Marlborough directly, travelling to Blenheim to pick him up only a few days ago." Freddie glowed with pleasure. "How I have longed for one of the Duke's spaniels! Only look at these beautiful chestnut markings on such a pearly white background. Thank you so very much, dear. There could be no gift that would please me more." She gently rubbed one of the dog's reddish ears, looking into his trusting brown eyes lovingly. For once, I could not experience the rush of satisfaction at pleasing Freddie. The need to get to the valises, to be certain the blue velvet book and its contents were safe gripped me. I felt it difficult to breathe normally. "George, what is wrong?" Freddie asked me, taking her gaze from the dog in her arms. "Are you upset over the loss of your belongings? They were only clothes, clothes that can be replaced. Indeed, think of the pleasure you will take in designing new ones. The important thing is that Robinson is safe and so is this adorable dog." Robinson stood very straight. "If, sir, you feel I have somehow failed you--"
"Of course not, Robinson. You did just as you ought. Go now. I know you wish to make yourself presentable again. Er, did any of your clothes survive the attack?" "Yes, sir. One of the bags did contain my things, the other yours. I have placed that one in your room and shall unpack it after I have washed." I held up a hand. "No need. I shall do so myself." Robinson gazed at me in some reproach. "Do not glare. I am only thinking of your welfare. I shall not require you tonight. Take care of yourself. Your hand looks as if it has been bleeding." Robinson cut a look at the dog who emitted a low growl. "The animal objected to being held back from the highwayman. The thing thought he would be able to fight the villain." "What a brave little soldier!" Freddie exclaimed. "He wanted to help defend you, Robinson, and got carried away. He must be sorry he bit you." "Yes, your Royal Highness," Robinson said in a wooden voice, looking like he would growl at the dog at any moment. "Step along to the kitchen, Robinson, and get something to eat. Cook will likely have a salve for your hand. If not, then ask Fishe. That reminds me, in all the excitement, I have quite forgotten poor Phanor's illness." I nodded at Robinson, and he bowed from the room. An unprecedented urgency spurred me to action. "Freddie, perhaps you could leave the new spaniel here with Ulga for a few minutes while you look in on Phanor. I shall go to my chamber and see what remains of my clothes." Freddie smiled. "Very well. I can see you are in dire need to view the damage." "A brand new pair of breeches could be among the casualties," I lied. "I must know if they have been spared." Stopping short on her way to hand the dog to Ulga, Freddie turned and eyed me curiously for a moment. I cannot trick her by playing the foolish dandy. She must have been wondering what was wrong with me, though neither of us spoke. Then she crossed the room and handed an admiring Ulga the dog, bending and kissing the white lozenge of fur between his eyes before letting him go. From the look in the dog's brown eyes, I could tell he was already in love with his new mistress. Who could blame him? Not I. Freddie has always been my Ideal of the perfect lady. None can compare to her. She turned and looked at me again, a question in her eyes. Without looking at her again, I turned and walked with seeming calm from the room. Once in the corridor, I strode quickly towards my room, deftly avoiding the still sleeping Humphrey. Flinging open the door to my chamber, I saw my valise on a small, backless sofa positioned at the end of my bed. Closing the door behind me, I rushed to the bag. This simply had to be the valise containing the blue velvet book. The scrapbook in which I keep poems I have written, drawings sketched by me and by my friends, mementoes, and letters. Including the one letter I never should have kept. The letter which would ruin Freddie's reputation if it fell into the wrong hands. The letter which would destroy the life in Society I had worked so hard to make for myself, and leave me with no choice but to flee England and all I loved forever.